Dental restorations such as fillings, crowns, and inlays/onlays are made of durable and sturdy materials. They restore and assist your teeth in their everyday functions of chewing, grinding, biting, and other similar actions. However, despite their durability, these dental restorations can still suffer from damage. They can break and fall off anytime without warning. When this happens, knowledge of the first aid steps and a trusted dental team are very important. The Glenroy Dental Group is your go–to Glenroy dentist for dental emergencies. With over 20 years of delivering premium quality service to the people in Glenroy, The Glenroy Dental Group provides quick and efficient service. Over time your dental restorations weaken from every day episodes of participating in your teeth’s functions. No matter how much we want them to last, dental restorations have a breaking point. Your teeth are not tools and neither are your dental restorations. If you want to avoid damage and enjoy them for a long time, you have to avoid using them as tools other than their normal functions. Biting down on a hard or sharp food/material, tearing tapes/ribbons, and opening packages are common forms of abuse. 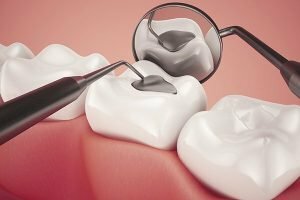 One of the common reasons for getting a dental restoration is tooth decay. A tooth damaged by decay becomes weak and can affect the surrounding teeth. To address this, dental restorations are employed by your dentist. Upon placement, all the decayed areas are removed and your mouth is thoroughly cleaned. Poor dental hygiene allows secondary cavities to develop and destroy the tooth supporting the restorations. Poor dental work by an unskilled dentist can affect the longevity and durability of your dental restorations. Locate and secure the crown immediately. Apply clove oil on the affected tooth to lessen the pain and sensitivity. Dental cement available in drugstores or petroleum jelly can be used to temporarily keep the dental crown in place on your way to the dentist. Rinse your mouth thoroughly to remove remaining broken pieces. Apply clove oil to the affected tooth to lessen the pain and sensitivity. To be safe, do not reattach the dental restorations; let your dentist handle it. Attaching them yourself creates the risk of swallowing or breathing them in. When swallowed, they simply pass. But when breathed in, they can cause an infection in your lungs.